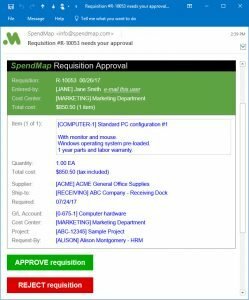 September 7, 2017 – We are thrilled to announce that Email Approvals will be available in the upcoming release of SpendMap, making the Requisition approval process faster and easier than ever before. You can now approve and reject Requisitions right from the body of the email notification that you receive from SpendMap, without having to log in to the system. 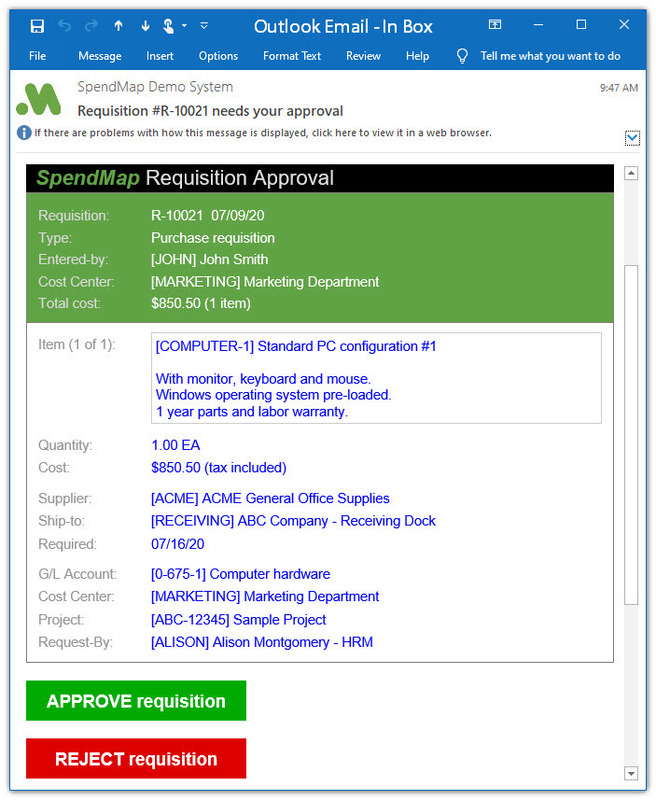 When you use this new feature, SpendMap will send an HTML email to the approver(s) with the same sort of information that you see on the Requisition Approval Screen within SpendMap itself. When you click the [Approve] or [Reject] buttons in the email message, a response email will be sent back to SpendMap, which will update the requisition accordingly. The email notifications are mobile-responsive, so you can approve orders quickly and easily on your smartphone or tablet while out of the office, whether connected to the Internet or not. Of course, you can still log in to SpendMap and use the Approve Requisitions Utility to access more advanced functions, like if you need to modify the Requisition or maybe re-route it to an approver who isn’t part of the normal approval workflow. Stay tuned for more information about the upcoming release of SpendMap. SpendMap is a leading developer of cost-effective software solutions for companies that need to streamline their Purchasing processes and better control their spending. For over 25 years, SpendMap has been helping customers improve their purchasing, payables and materials management processes to slash paperwork, control spending and cut costs. For more information or to schedule a demo, here’s how you can reach us.